Today only (8/26) these Superior 1500 Series Rayon Bamboo Microfiber Solid Sheet Sets start at $21.99! Sizes Twin-California King. Sleep soundly through the night with Superior's Bamboo-Microfiber sheet set. This sateen-weave blend sheet set is a customer favorite that helps to keep you cool in the summer and toasty warm in the winter. 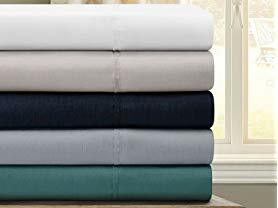 Available in five alluring colors, these sheets are super soft to the touch and silkier than cotton and linen, all while keeping the perfect temperature for a restful night's sleep. SILKY SOFTNESS: This premium Bamboo-Microfiber blend fabric ensures super softness and luxurious feel and is composed of 35-percent premium quality bamboo and 65-percent durable polyester. DEEP POCKETS: The 15" Deep Pocket fitted sheet with elastic all the way around is perfect for 6-18" oversized mattresses. Pair with Superior's White Down Alternative Pillow Sets, Comforter, and Mattress Topper for a perfect bedroom oasis (sold separately). SATEEN SHEEN: A soft palette of irresistible sateen pastel and dark colors is available in various sizes suitable for everyone in your family. SOOTHING COLORS: These ultra-soft sheets come in an impressive array of colors: chrome, light blue, navy blue, teal, and white. EASY CARE: These beautiful sheets are colorfast and machine washable. For drying, tumble dry low and remove promptly from dryer. Always follow care label instructions for best results. Do Not Bleach. Do Not Dry Clean.